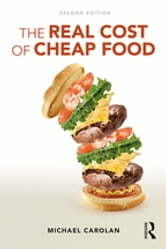 This thought-provoking but accessible book critically examines the dominant food regime on its own terms, by seriously asking whether we can afford cheap food and by exploring what exactly cheap food affords us. Detailing the numerous ways that our understanding of food has narrowed, such as its price per ounce, combination of nutrients, yield per acre, or calories, the book argues for a more contextual view of food when debating its affordability. The first edition, published in 2011, was widely praised for its innovative approach and readability. In this new edition the author brings all data and citations fully up to date. Increased coverage is given to many topics including climate change, aquaculture, financialization, BRICS countries, food-based social movements, gender and ethnic issues, critical public health and land succession. There is also greater discussion about successful cases of social change throughout all chapters, by including new text boxes that emphasize these more positive messages. The author shows why today's global food system produces just the opposite of what it promises. The food produced under this regime is in fact exceedingly expensive. Many of these costs will be paid for in other ways or by future generations and cheap food today may mean expensive food tomorrow. By systematically assessing these costs the book delves into issues related, but not limited, to international development, national security, healthcare, industrial meat production, organic farming, corporate responsibility, government subsidies, food aid and global commodity markets. It is shown that exploding the myth of cheap food requires we have at our disposal a host of practices and policies.